I WOKE UP earlier than planned because my brother jolted me from sleep. Then he showed me his phone and said, "I'm on Youngblood!" He wrote the article, which first appeared on his personal blog, to honor our father today. If you have the time, it's a worthwhile read. As for me and my family members, we're going to find an actual newspaper, cut the article out, and have it framed for posterity. 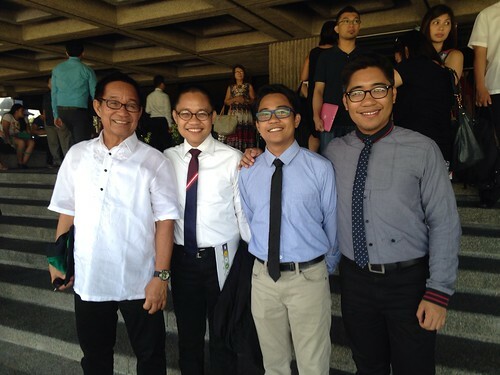 Tatay and my brothers. I practically handpicked all of their eyeglasses to fit them right. Don't forget to de-acidify the newsprint so it doesn't turn yellow and crumble in the future.